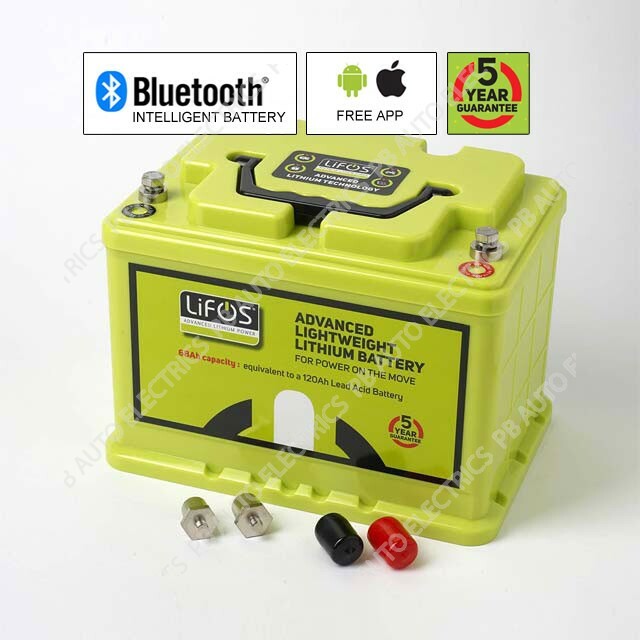 The LiFOS 68Ah Lithium Battery (equivalent to a 120Ah leisure lead acid battery) is an advanced battery using the new premium in lithium battery chemistries – Lithium Iron Phosphate (LiFePO4) – which delivers reliable and safe power in virtually all conditions. Perfect for voltage sensitive and high cycling applications including leisure, commercial and off grid renewable energy installations. Please Note: This item is dispatched direct from our supplier and as such is not available to ship outside of mainland UK. Motorhomes, Caravans and Motor Movers:- Efficient, long-lasting power wherever your travels take you. Solar off-grid systems:- Longer battery life, fewer service visits. Emergency service vehicle auxillary battery applications. DC motors or other device up to 1000w (tested with numerous outboards and caravan motor movers). 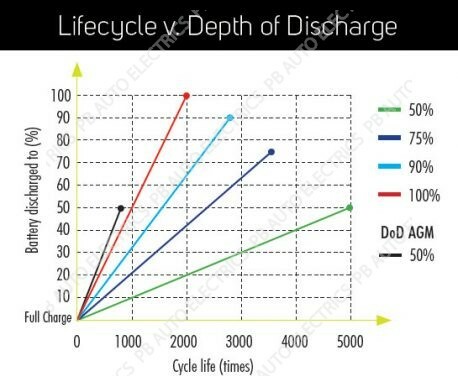 charge and discharge cycles – see graph on back page. Further, if LiFOS is only partially discharged to 50% of its capacity, for example, the number of times it can be charged and discharged jumps to 5000 (+13yrs). All batteries have a DOD. 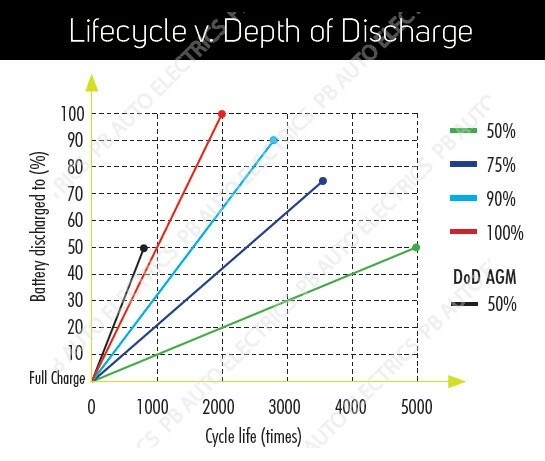 It’s typical to expect a battery using lead acid and gel compounds to give a 50% DOD. This means if, for example, such a battery is rated at 100Ah, it will only provide usable power of 50Ah. LiFOS has a 90% DOD, providing 61.2Ah of usable power, which means that to replicate the available power provided by LiFOS, a +120Ah lead acid or gel battery would be needed. Provide users with a unique view of the charge and discharge performance of their battery on a smartphone via a simple-to-understand Android or Apple App. This free to download App provides extremely accurate information – generally far more so than a typical analogue battery meter. The App, once connected to a smart device, will also sends users a reminder to put their LiFOS on charge once it has been discharged to 30%, thus further prolonging its life. * The LiFOS battery will go into dormant mode when battery voltage is < 8V and battery output is 0V. Please contact us or use a specific LiFePO4 battery wall charger to recharge it for 3-5 minutes, which will release it. Please contact your dealer/retailer to get the wall charger if necessary. 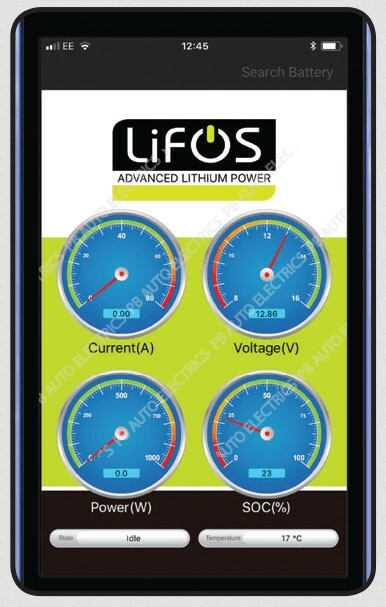 Monitor the state of charge of LiFOS batteries through a smartphone via our unique app available online for free download (Apple or Android). LiFOS is fitted with removable terminal posts, compatible with caravan quick release connectors, so that it can fit in the smallest space possible. The posts can be removed and ring terminals connected directly onto the terminal plates. In addition, two LiFOS batteries can be joined in parallel to create double the (AH) capacity. (Please note that LiFOS cannot be joined in series to create higher voltages. LiFOS is a featherweight 7.8kgs. 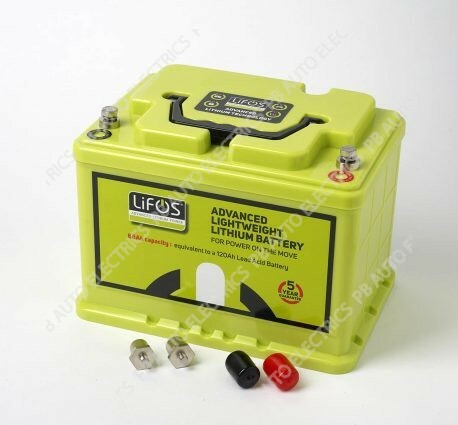 When compared to a good quality 120Ah lead acid battery at circa 34kgs, LiFOS gives an impressive 77% weight saving – and in motor campers, caravans and boats, saving 27+ kilograms can be crucial. LiFOS does not emit noxious gases therefore does not need to be housed in a specially vented chamber. 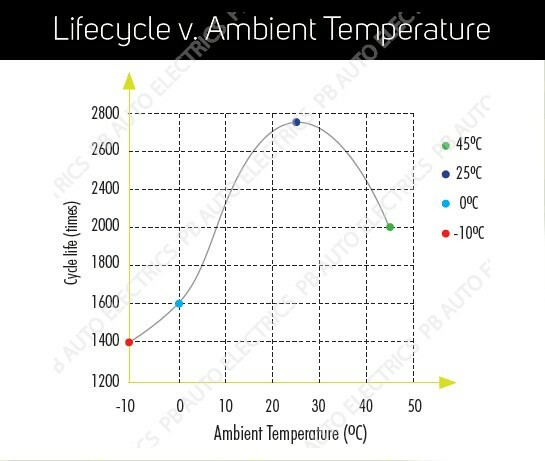 LiFOS has a huge operating temperature range of -20 to +60 °C and it can be used in any orientation (e.g. on its side), although on its base will give the best performance. Like all batteries it should not be allowed to discharge fully over a long period and if it will be left without any power input for a 6-month period the LiFOS must be charged. A warning will be sent via the App as a reminder – see previous page, ‘Battery Management and Communication System’. For more safety information, download the MSDS and Data sheet from www.lifos.co.uk (click on the ‘Data’ tab). 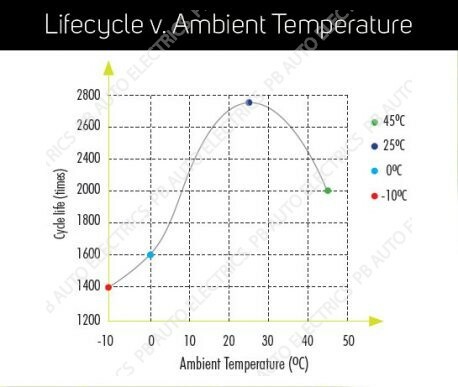 Note: LiFOS can discharge in temperatures down to -20°C but cannot receive a charge at any temperature lower than 0°C. If LiFOS is housed within a housing such as a caravan battery compartment or similar, it should be protected from freezing temperatures. If, however, LiFOS is exposed to the elements it should be placed inside a battery box or similar with some level of insulation. Monitoring the state of charge in the LiFOS battery is easy with the free to download Apple and Android Bluetooth-enabled app. Once connected to a smart device, the app will also send users a reminder to put LiFOS on charge.